Robert Dickson wins U23 World Title. 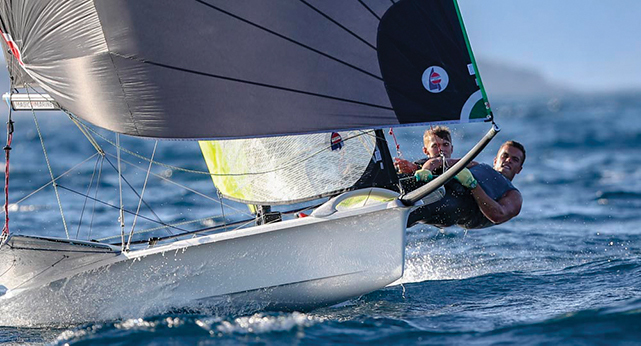 DCU sailing champion Robert Dickson is preparing for the Olympics after taking gold at the U-23 Sailing World Championships in the 49er class in France. Dickson, along with his teammate Sean Waddilove, became world champions after a five-day sailing regatta in Marseilles, France in August and are now in training for the next Olympics. “We still have to qualify. The first qualification at the senior worlds this year, the nation didn’t qualify so we have another chance to qualify, in New Zealand in the 2019 worlds,” said Dickson. After becoming world champions, which had its hardships, the pair’s next goal is to make it past the qualifiers and onto the Olympics. “We’re going to try go there (New Zealand) and qualify the nation (Ireland) and then after that there’s a series of individual qualifier events so it will be decided which one will go,” said Dickson. Dickson won gold at the 49er Sailing World Championships in August after a five-day event took place. Although there were obstacles in their way at times, he said that he felt confident throughout that it would be a victory. “We went into the regatta feeling pretty confident, we knew we had a chance to do well in the regatta from all the other regattas we had this season, straight through the regatta we just tried to keep a level head and then coming up to the last few races it was getting pretty nerve wrecking because we were overnight leaders so we went into the last day in the lead,” he said. Although he was confident in the regatta, Dickson knew that at any moment something could switch. “I knew that we already had the lead anyway at that stage so it was kind of just consolidating our points against the rest of the fleet and I knew roughly about where all the other boats were so I was pretty confident that we had won it at that stage but it’s never over because it was still really windy and we could’ve capsized at any point up to the finish line. “We didn’t have it until the last jibe, the last few meters when we crossed the line,” said Dickson. It wasn’t until a gear malfunction occurred that there was any type of scare in the course of the regatta. After a break to a vital piece of equipment, Dickson had to act quickly to assure that he would maintain a leading position. “Our tiller extension broke, for steering, so it wasn’t actually that the gear failed per say, it was that I fell over and landed on it so it broke,” Dickson said. “We just came out of a tack and I tried to go out on the wire and I basically just held on to the tiller extension too hard and snapped it over the side of the deck by accident because I was half falling out. “I managed to not fall out in the end and drag myself back in, put the new tiller extension on and finish the race. “I didn’t get emotional about it and tried not to worry about it too much and move, race the next race,” he added.